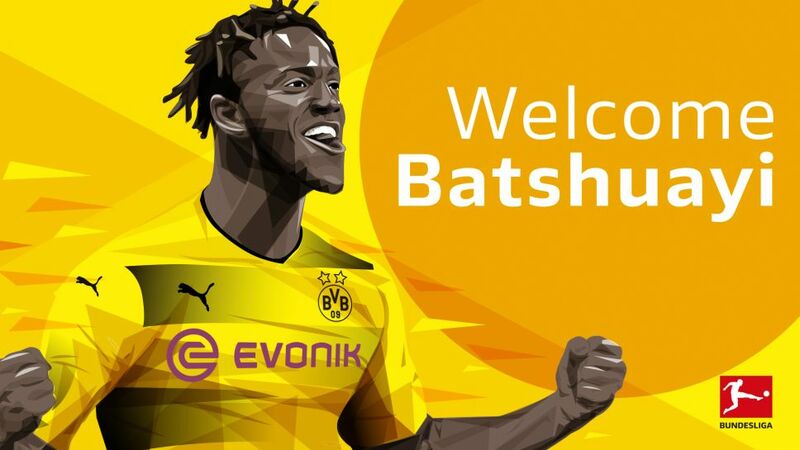 Borussia Dortmund have moved swiftly to bolster their forward line following the departure of Pierre-Emerick Aubameyang by signing Chelsea striker Michy Batshuayi on loan until the end of the season. Aubameyang, Dortmund's leading scorer this season with 13 Bundesliga goals completed a transfer to Arsenal on Deadline Day, and BVB responded by recruiting Belgium international Batshuayi from the Gunners' English Premier League rivals. Batshuayi joined Chelsea in summer 2016 on a five-year deal, and was new manager Antonio Conte's first signing. The 24-year-old Brussels-born forward scored five top-flight goals last season, including the late strike against West Bromwich Albion that secured Chelsea the title. The former Standard Liege and Marseille man has made 12 Premier League appearances this season, but just three starts, scoring twice. He also registered a brace of goals in four UEFA Champions League games to help Chelsea into the knockout stages, but is eligible to play for Dortmund in the UEFA Europa League knockout stages. The 1996/97 European champions are set to play Serie A outfit Atalanta in the Round of 32. Batshuayi's younger brother, Aaron Leya Iseka, recently played against Dortmund for Belgian club Zulte Waregem in a friendly in Spain in January. Dortmund won the game 3-2 thanks notably to two goals from Aubameyang.